I remember clearly the day that standards invaded my teaching. It was a gorgeous summer day in northern Arizona. I was attending a summer institute on integrating core subjects like English with CTE. I was a hotshot young teacher who had finished his second year in a very challenging school, ready for the new gear that comes with a third year of experience anywhere. Our school had a new principal--my third in three years. He came up to Flagstaff to meet us on the campus of Northern Arizona University. We talked about Superior High School--he was an alumnus, a native of the town--we talked about what we liked, what the school needed. Then he looked at me and asked, "What standards are you using for English?" I was completely taken aback. To be honest, I didn't have an answer, despite two years of teaching, despite two years of administering the AZTLA exam to my English students. Since that day in Flagstaff, I have been sure to know the answer to that basic question. I knew the answer by the time I went back to school at SHS. I knew the answer when I returned to teaching in Tennessee. I'd like to think that I'm part of the answer as an active and enthusiastic advocate for Common Core State Standards. And I'm not about to stop. Back in the day (insert old man voice) when I started teaching, teachers followed the book, not the standards. Every ELA had a literature textbook--and often a writing exercise book--and teachers began with chapter 1 and worked their way to the last chapter over the course of the year. This was particularly important in survey-style classes of American literature (11th grade) and British lit (12th grade). My first response to the new principal's question, "what standards are you using," would have been to tell him about the book I used. Instead I chose the smarter response: I stammered and equivocated and blustered about portfolio assessment. Later when I returned to teaching in 2004 (I left full-time teaching for five years to raise three kids, get a graduate degree, and explore adventures abroad), I learned that Tennessee had a new set of standards called SPI's. These were exhaustive--over 90 in ELA alone--but they specified specific points that all students should learn. And of course students were tested--and my value-added score was directly impacted by student literacy scores. Nevermind that writing was tested but not graded, or the myriad other things I did as a teacher to ensure my students' future success in college. With Common Core in 2010, a new set of standards arrived, which were more streamlined and designed for broader skills like writing and literacy rather than specific lessons in "foreign words & phrases" or "logical fallacies." It was a step in the evolution of standards that I approve of, and I especially liked collaborating with teachers outside of Tennessee on a common framework in designing lessons and sharing experiences. In EdWeek today, Marc Tucker published a blog that addresses the current state of standards and looks forward in a remarkable, insightful way. A major revision to ESEA is in place, and one key component is a return of responsibility to set standards and test them from USDOE to state education agencies. What will states do with this power? Will they use it for good or for ill? Tucker looks beyond the specifics to focus on what could happen--the logical progression to more performance-based assesment that the current anti-high-stakes-testing movement has already set into motion. In the top-performing countries, it is almost always the case that the examinations are based on course syllabi that define the curriculum that is derived from the standards. In secondary school, the examinations require the students to write short essays in response to the examination questions. All of the examinations questions are released after the examination is given and a library of them is available to everyone. Examples of student responses earning high grades are released as well as commentaries on the grades given. What Tucker is arguing for here is a performance-based diploma (I would argue more precisely for a performance-based system of advancement to any grade). Modeling would be provided by showing examples of good answers--and the examiners' rationale for their grades. It would give parents specific ideas about the expectations for their children, rather than a confusing list of standards that require interpretation by professionals like me. 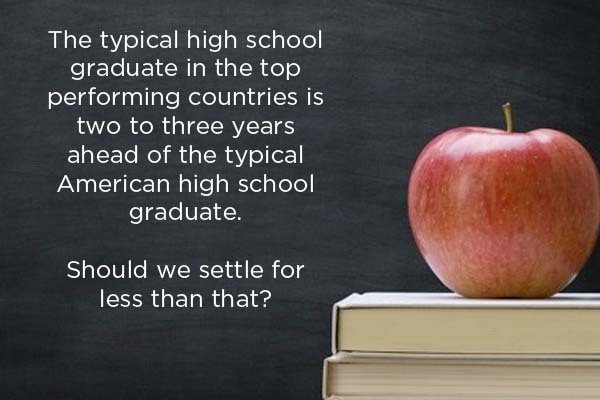 If we could transition education from a search for grades and age-appropriate advancement onto something new--a succession of achieved standards--this could really become something. Right now there are too many dark areas where teachers and administrators can hide kids who just need to achieve standards. 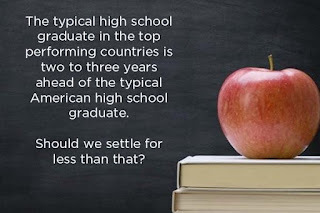 ...As I see it, the single biggest source of the very wide disparity of performance among American students is the difference in expectations that teachers have for different students and different groups of students. I have worked hard to implement CCSS in my state and to defend them from attacks that were counter-productive. But this is because of my unique obsession with standards which has covered 15 of my 17 years as a teacher. I cannot wait to move forward into a new era where performance-based assessment is used more widely and where standards are clarified for all parties.